It seems the ancient Roman penchant for technological avenues also extended to well-made chicken stew. At least that is the notion inculcated by a group of Italian archaeologists, as they have come across ancient specimens that allude to non-stick frying pans that were produced more than 2,000 years ago. The cookware in question here pertains to the so-called Cumanae testae (or Cumanae patellae), ancient utensils whose names basically translate to ‘pans from the city of Cumae’. In fact, their ‘effectiveness’ when preparing chicken stew is already attested by the Roman cookbook De Re Coquinaria (which was compiled from a collection of Roman cookery recipes known as Apicius, circa 4th century AD). Now while the name of the ancient cookware was already known to historians, they were not sure about the actual compositions of these pans from Cumae during the Roman times. 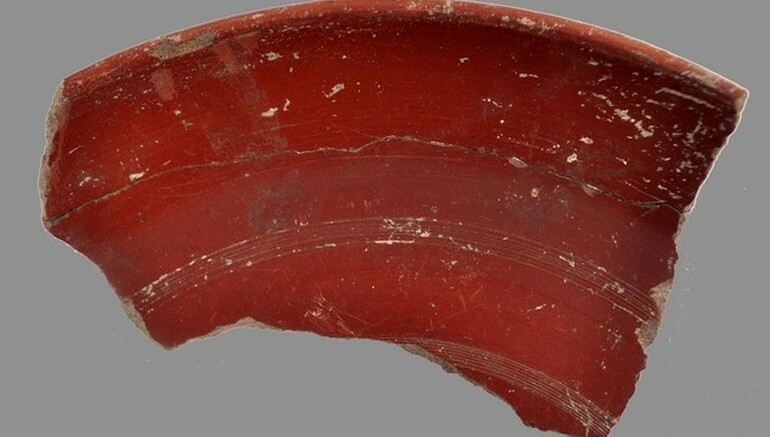 Interestingly archaeologist Giuseppe Pucci made a hypothesis (in 1975) that Cumanae testae referred to the Pompeian Red Ware, a pottery-type which was known for its heavy red-slip coating in the inside. And now a trio of archaeologists – Marco Giglio, Giovanni Borriello and Stefano Iavarone (from the University of Naples), have backed up this hypothesis with extant evidences found in Cumae. To that end, the researchers came across an ancient ‘dump site’ that contained over 50,000 pieces of pots and pans – with most of the fragments showcasing variant shapes, thickness and distinct coatings. To their surprise, the archaeologists also identified fragments with the red-slip coating that was instrumental in providing the non-stick (adhering resistant) surface conducive to cooking stews. Dating from the period between 27-37 AD, many of the recovered fragments were analysed and found to be of high quality. And given the sheer volume of the discarded pottery pieces (in spite of good workmanship), the researchers have concluded that Cumae was probably one of the major manufacturing centers for red-slip cookware. In fact, some quick assessments have confirmed that these pans boasted a specific clay-mixture that was slightly different than their Pompeii counterparts. In essence, the non-stick quality (derived from the anti-adhesive coating) of these Cumae-produced frying pans were possibly of better quality than the aforementioned Pompeian Red Ware. And to put things into perspective, archaeologists till now have only been able to excavate around a paltry 10 percent of the pottery-production facilities in Cumae that churned out such top-quality cookware during the Roman times. Lastly, it should also be noted that Cumae was a thriving polis even before the advent of the Romans, and as such this ancient coastal settlement (by the Tyrrhenian Sea, about 12 miles west of Naples) was a major Greek colony in what was known as Magna Graecia.